The SNP has called for "technical discussions" between the UK and Scottish governments ahead of the 2014 independence referendum. Scottish Secretary Michael Moore has insisted UK ministers will not "set out a contingency plan" for independence. Meanwhile former Lib Dem leader Sir Menzies Campbell has said he thinks the Ministry of Defence (MoD) must be looking at the impact of a yes vote. 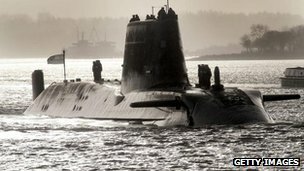 The UK government has said it will not review Trident's future before 2014. Earlier this week it said moving nuclear weapons from the Clyde after Scottish independence would cost billions of pounds and thousands of jobs. UK ministers also said they had no plans to review the future of the Trident missile programme, based at Faslane on the Clyde, ahead of next year's referendum. Speaking on the BBC's Sunday Politics Scotland programme, Sir Menzies backed the coalition government's stance but said he would be "very surprised" if the MoD was not considering the consequences of a yes vote. He said: "I think it is very sensible indeed not to indulge in the kind of negotiations which have been suggested but I also think that somewhere within the Ministry of Defence there will be a group of people looking at the implications of independence. "But it will be being done in a very private way and certainly not a way which will be susceptible to publicity." The SNP has insisted Trident's base on the Clyde has a bright future as a centre for conventional and not nuclear weapons. But Sir Menzies questioned "what exactly those conventional arrangements would amount to". He added: "Would that in any way compensate for the inevitable cost of the removal of Trident and the Astute class?" Labour has accused the SNP of "ducking and diving" questions on the future of Trident if Scotland became independent. Shadow UK Defence Secretary Jim Murphy said: "What would happen in the Clyde if the SNP got their way just to get rid of the nuclear submarines? What would happen to shipbuilding on the Clyde? And just what would the SNP do, if they won, about the size of the army, the navy and an air force?" Speaking on the same programme, SNP defence spokesman Angus Roberston said "the anti-independence parties were using any opportunity to scare the wits out of people and suggest that independence is going to cost a whole load of jobs and investment". He said: "It is the status quo that is bad for defence in Scotland. In the last decade we have lost more than 11,000 defence jobs." He went on to urge both the Scottish and UK governments to "work together" ahead of the referendum. He said: "I don't see why it's difficult that the Scottish government and the UK government can have a series of technical discussions, after all that's what happened in the run up to the Edinburgh Agreement. "I would appeal for less of the smears, less of the scare stories, less of the 'can't do' attitude. Let's have a 'can do' attitude and embrace what is a really exciting and historic opportunity for Scotland." Mr Robertson's call came in response to comments by Scottish Secretary Michael Moore insisting the UK government would not enter into negotiations over the terms of Scottish independence before the 2014 referendum. Writing in the Scotland on Sunday newspaper, he revealed that the government at Westminster plans to publish a series of papers over the coming months that will look at Scotland's current position, and the choices it would face if the country voted to leave the UK. However, Mr Moore warned: "What this work will not do is open up negotiations or set out a contingency plan for independence. The UK Government works for the whole of the UK including Scotland, and we are deeply committed to the United Kingdom. "I and my ministerial colleagues represent the whole of the UK; we cannot - and should not - negotiate or plan in the interests of only one part of it." A spokesman for the Scottish government said: "It is in everyone's interests that preparations are in place for a yes vote in next year's referendum, and that is exactly what the Scottish government is doing." Moving nuclear weapons from the Clyde after Scottish independence would cost billions of pounds and thousands of jobs, the UK government claims. What is a Section 30 order?